Pest description and crop damage Bright green caterpillar with a black or brown head. They roll leaves together using silk to create protected feeding sites. When these sites are located near developing nuts, feeding damage to the nuts can occur. 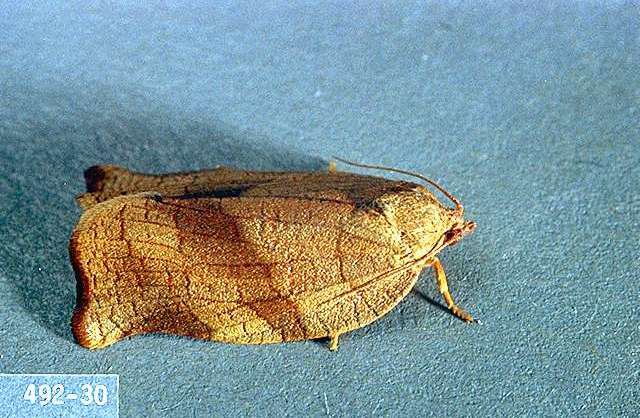 Adult moths are bell-shaped, up to 1 inch long, tan to brown, with broad bands on the wings. Their appearance is very similar to omnivorous leafroller, although the omnivorous leafroller has a more pronounced bell shape to the wings when viewed from above. Biology and life history There are two generations of obliquebanded leafroller each season, occurring from May through harvest. Early stage (minute) larvae overwinter under the bark on scaffold branches of a variety of host plants and may feed during warm periods in winter but become active in spring with onset of new growth. Larvae exhibit a characteristic rapid backwards wiggle from the feeding site when disturbed. They feed for several weeks in the leaves, typically forming a new feeding site prior to pupation. Adult moths emerge in late June to July. These moths lay eggs for the second generation. The second generation hatches in early July. 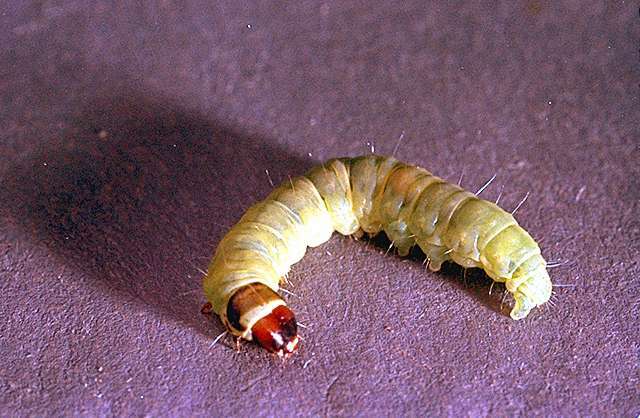 Larvae feed on leaves but may occasionally damage nuts if their feeding site happens to be within a nut cluster or in direct contact with a nut cluster. Pest monitoring Start checking for larvae around mid-March by inspecting three terminals per tree and three leaf clusters per terminal. Each terminal is a sampling unit. Check for adults by using one pheromone trap for each 5 acres, placed 6 ft high in the tree canopy starting in mid-May. Treat larvae when infestation level is 20 to 25%. Treat for adults when catch is 40 moths per week and larvae are feeding on nuts. The first flight usually is in June. Spray when pheromone traps catch five to eight moths over a 3-day period. The second flight usually is in September. Obliquebanded leafroller larvae are targeted by a wide variety of specialist and generalist parasitoids that normally keep populations under control after the spring generation. Sprays are rarely necessary and if they are applied against mature larvae, they will likely harm natural enemy populations. Examine feeding sites of mature larvae to get an idea of natural enemy activity. Small cocoons or caterpillars being consumed by small larvae indicate active biocontrol. 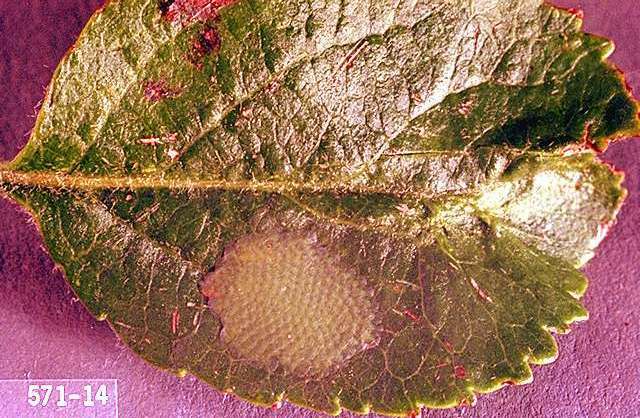 Conserve natural enemies through judicious insecticide use, but monitor leafroller numbers as population build-up can be rapid. 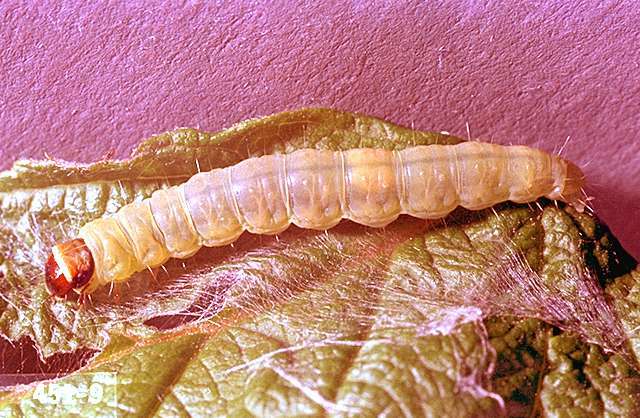 If necessary, spray in spring after overwintering larvae emerge, around the time leaves are 0.75 to 1 inch long. Control is much more effective if sprays are applied when larvae are small but these young larvae are the most difficult to detect. carbaryl (Sevin XLR Plus) at 0.5 to 1.25 quarts/100 gal water (2 to 5 quarts/a). PHI 14 days. REI 12 hr. May cause rapid increase of aphid populations 3 to 4 weeks after application. Extremely toxic to aquatic invertebrates. chlorpyrifos/O-diethyl-O-(3,5,6-trichloro-2-pyridinyal) phosphorothioate (Vesper,Vulcan) at 3 to 4 pints/a. PHI 14 days. REI 24 hr. Do not make more than 3 applications per season. esfenvalerate (Asana XL) at 8 to 12 fl oz/100 gal water (10 to 18 fl oz/a). PHI 21 days. REI 12 hr. Do not exceed 0.2 lb ai/a per season. Extremely toxic to fish and aquatic habitat. esfenvalerate (S-fenvaloStar) at 9.6 to 12.8 fl oz/100 gal water (10 to 18 fl oz/a). PHI 21 days. REI 12 hr. Do not apply more than 0.2 lb ai/a per season. Extremely toxic to fish and aquatic habitat. Apply with first filbertworm moth flight in early summer, do not apply second treatment within 3 weeks. Do not apply more than 0.2 lb ai per season. Highly toxic to bees, fish, and aquatic invertebrates. methoxyfenozide (Intrepid 2F,Troubadour 2F) at 0.12 to 0.25 lb ai/a. PHI 14 days. REI 4 hr. Do not apply within 25 ft of an aquatic habitat, 150 ft if applied by air. Spring (overwintering) generation-Apply once or twice, depending on infestation level. Summer generation-Apply first during the period of peak egg lay to early egg hatch (200 to 400 DD, following biofix). Reapply 10 to 18 days later (usually 500 to 700 DD). Do not exceed 24 fl oz/a per application or 64 fl oz/a (1 lb ai/a) per season. Do not apply within 25 ft of an aquatic habitat, 150 ft if applied by air. spinosad (Success 2L, Entrust SC) at 4 to 10 fl oz/a. PHI 14 days. REI 4 hr. Do not exceed 29 fl oz/a per year. Entrust SC is OMRI-listed for organic use.